The money you donate today will forever change the life of those in need. Our DYLAN THOMAS project is designed to assist children who participate in the arts. We assist children in need of financial aid, supplies, or equipment . Awards will be issued to qualified students of the arts to further their education and/or development of their gift. We at the Misfit Angel Network believe that all lives matter. For a few pennies a day you could give hope where there is none. Your donation will help feed, clothe, and deliver supplies to those in need. Follow us on social media for all out latest news, updates and event information. Click the link below. Although we may not be able to change the world, we at the Misfit Angel Network believe that we can change one person's world. One out-stretched hand at a time, we acknowlege all voices: the needy ones, the invisible ones, and the voices of those who want to stand beside us. Every penny here makes a difference needed in someone's life. Every sandwich handed to the hungry and every child awarded a dance lesson that their parents can not afford need us to keep making a difference. Our video shows some places where we have made a difference and many places we still need to go. Heroes do not look like they used to; they look like you do. Our volunteers collect, provide, and deliver essentials such as food, toiletries & feminine products, warm clothing/shoes, tarps & blankets, and medical attention or equipment. For those fortunate enough to gain residence, we have provided home furnishings and holiday gifts/toys where there would otherwise be none, all along with many hugs to our littlest or biggest, sickest or healthiest, angels in need. We have learned that poverty does not discriminate so neither do we! Through the Dylan Thomas Project, we at the Misfit Angel Network support local children-in-need who have a passion for the arts. 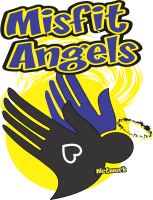 The Misfit Angel Network is a New Jersey-based, 501(c)(3) non-profit organization. Founded officially in 2016, we are a 100% volunteer-based group that has been assisting those in need for over a decade. We maintain a staff of six, none of which receives a salary or reimbursment. We rely on donations from the public (financial, time, or essentials) to continue our mission. All donations to the Misfit Angel Network are fully tax-deductible. The Misfit Angel Network has worked with divisions of Housing and Urban Development and Public Transportation, as well as soup kitchens, churches, local officials, and community leaders. We have been recognized with citations of honor from local and state authorities for the superior attention and effort that we give to each of our friends in need. Because of our commitment, we have also been recognized by many sister groups in the tri state area.